Pressing the button now initiates the appropriate interrupt handler. In our example, this is the increment / decrement the working register REG and subsequently sending its state on output, which is a port C - its first 6 bits. Its status is indicated by 6 LED. 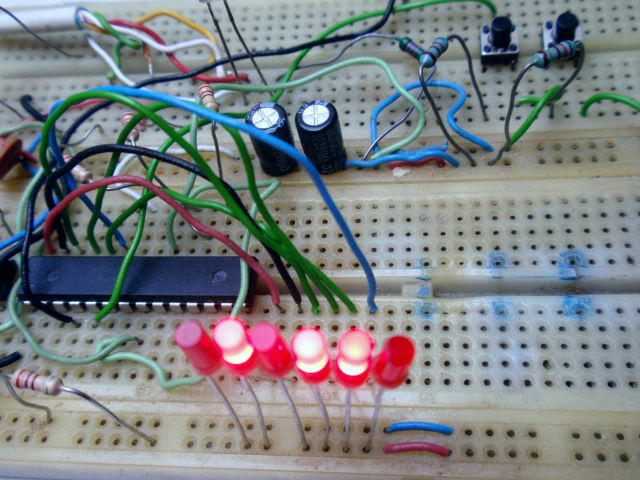 Now you have built the binary counter, you can press a one button to add 1 and second button to substract 1. Schematic diagram of this experimental circuit you can see below. This video on the bottom of this page demonstrates the function. You can certainly find a lot of other things to which buttons can be used :). When no interrupt is being executed, the program loops it the endless loop (called SMYCKA in the cource code). There's nothing in the loop, but you can add something. The program is available for download below. 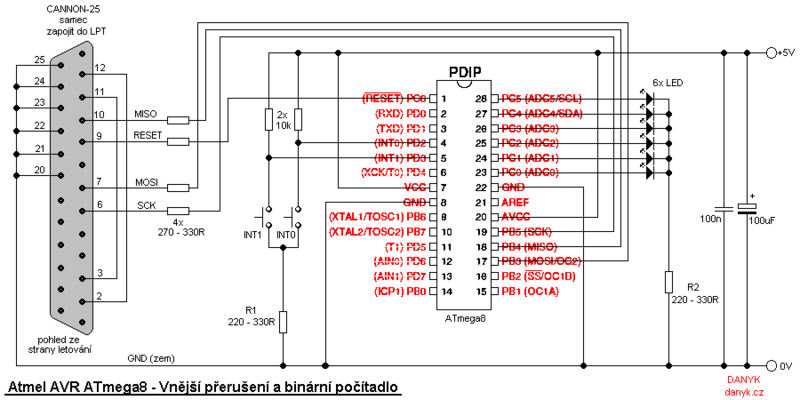 ATmega8 experimental circuit schematic. Allows both programming and testing. Video - circuit functionality demonstration. Warning! Incorrect connection can damage the microprocessor, LPT port or an entire PC.